Once Bruce Springsteen leaves the the Walter Kerr Theatre, a different kind of legend will take his place. Hadestown, the folk-music-inflected tale of the Greek myths surrounding Orpheus and Eurydice and Hades and Persephone, will premiere on Broadway at the Walter Kerr this spring. Created by Anaïs Mitchell and developed with The Great Comet director Rachel Chavkin, Hadestown was developed at a community theater where Mitchell had worked before gaining a following through a concept album. It then ran Off Broadway at the New York Theatre Workshop in 2016, out of town in Edmonton last year, and then at London’s National Theatre this fall, where it is currently playing. 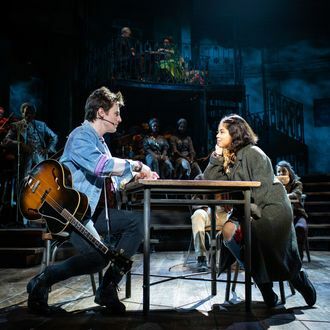 That cast currently stars Eva Noblezada, Reeve Carney, Patrick Page, and Amber Gray, though the production has not announced casting for its New York run. The Broadway iteration will start performances March 22 and open April 17.